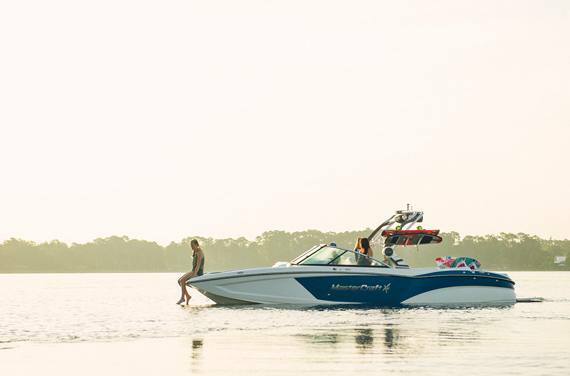 When refinement and sophistication meet performance and power, you get the astonishing new X26—and it’s changing everything you know about a day on the water. There’s no industry precedent for this level of craftsmanship and luxury—every inch is designed with thoughtful details and polished to premium perfection. 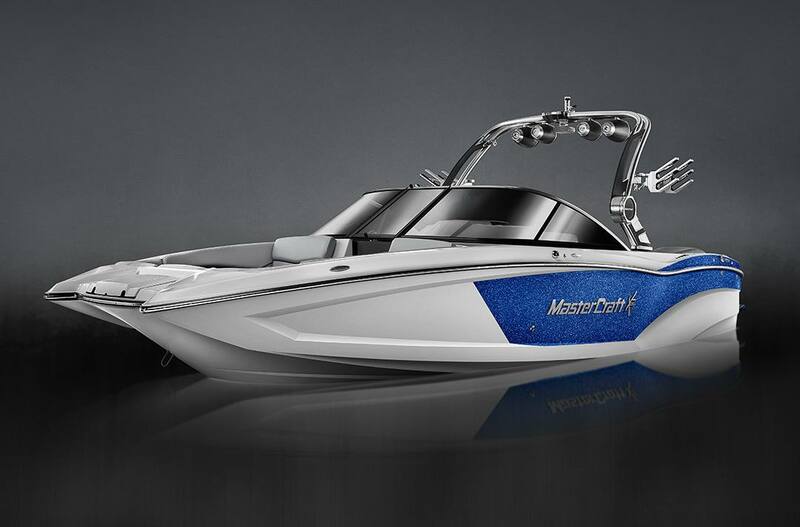 It’s impressively large at 26’, and its brand new hull shape provides a huge advantage with a smooth, dry ride even in big water. With available extras like a head and a refrigerator, you can extend your excursions much longer. The horizon marks the edge of what’s possible—the furthest place we can go. 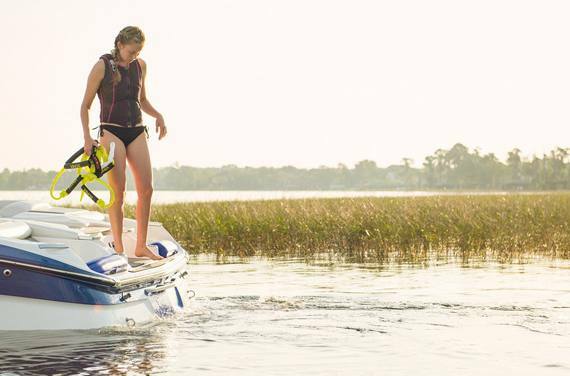 With the X26, your horizons are completely redefined. Lounge with a View: The forward lounge on the X26 provides unparalleled spaciousness and comfort thanks to the pickle fork bow, arm rests and plush seats. Down in Front: Keep your extra towels, life jackets and gear dry and out of the way under the seats in the bow lounge. Flip It Forward: Underneath the seats in the bow lounge is generous carpeted storage. Flip it up and drop it down. 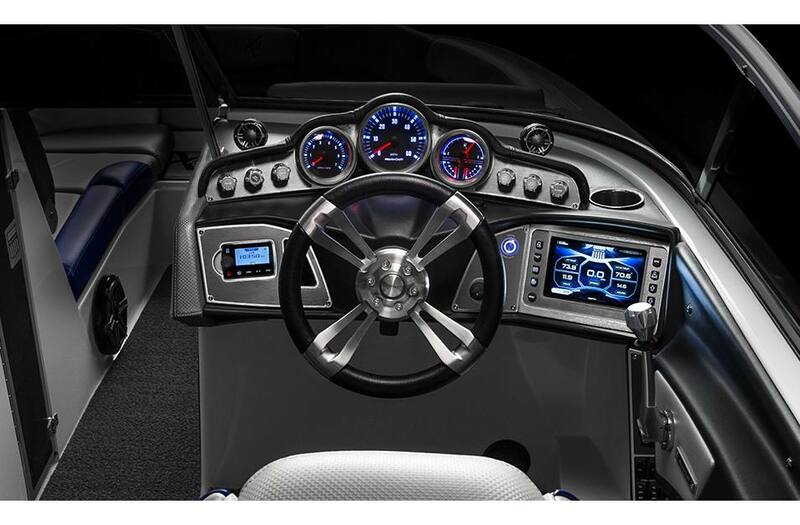 Power and Grace: From the billet steering wheel to the bow thruster joystick, every detail in the cockpit is designed to put you in precise control. Choose Your Views: The passenger seat lets you look forward or backward to keep your eye on the action out back–or on what’s ahead. 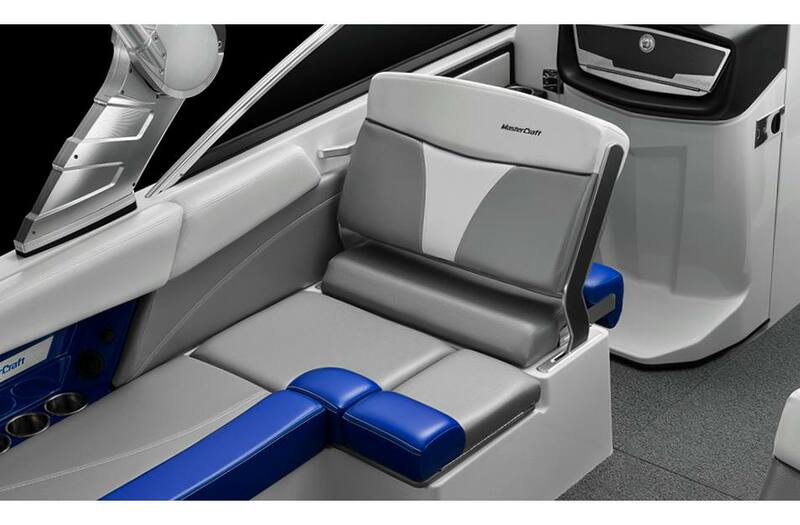 Ride Shotgun in Style: The passenger seat is comfortable, durable and flexible. Sit back, or forward, and enjoy yourself. Stay All Day: Extend your excursions all day with the ability to add a refrigerator–or room to bring along a third cooler. Ilmor Power: The X26 is powerfully propelled by the industry’s leading and most reliable engine builder: Ilmor. In Thrust We Trust: The all-new bow thruster on the X26 makes docking a one-fingered proposition. Heads Up: Choose to add the optional head–or leave the space empty for more prime storage space. 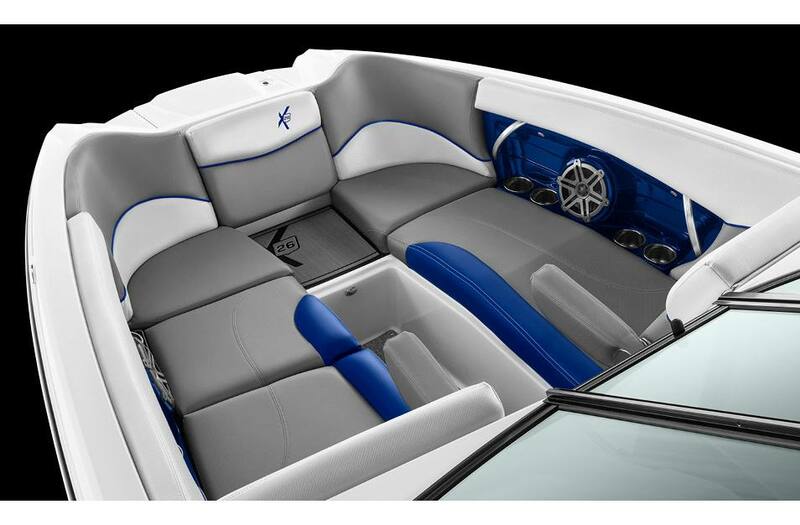 Kick Back in the Back: Lay back, take in the sunset and reflect on the fun with rear facing transom seats. 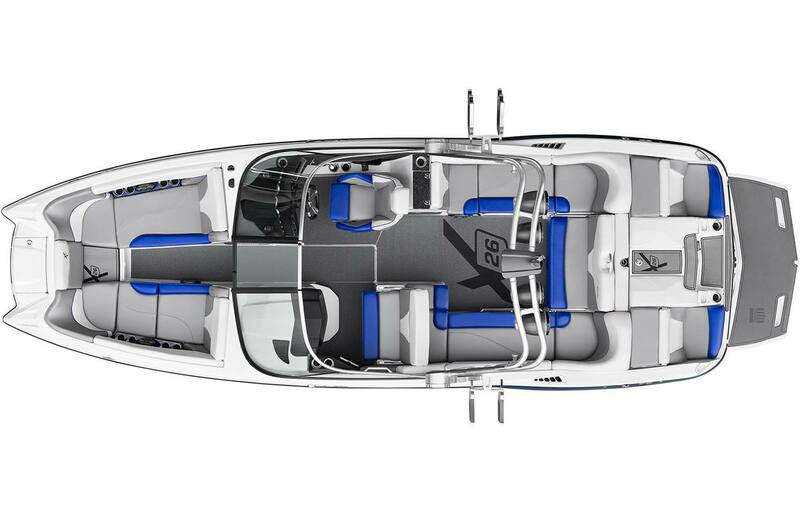 Deep Keep: The transom opens up for even more deep storage. Bring it all because you have room to store it all. 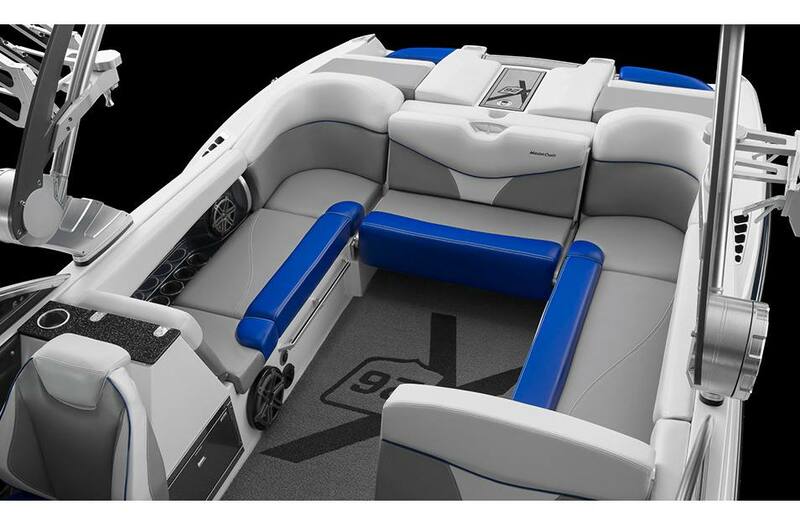 Wasted Space: The X26 features a hidden trash bin to keep the decks and the lake debris free. Wrapped in Style: Wraparound plush seating in the lounge offers up space and comfort to let your guest list run long. Award Winning Surf: Add the award winning Gen 2 Surf System to the X26 and be ready to get barreled in an absolutely massive wave. 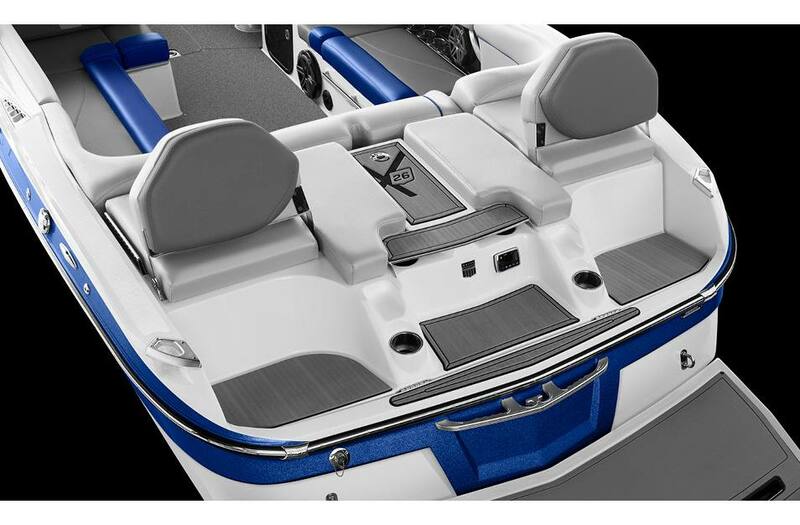 Clear the Decks: Keep the decks clear for cruising thanks to spacious carpeted coffin storage with gas-shock assisted access. Interior Width is measured from fiberglass inner gunnel to fiberglass inner gunnel. Boat Height specs reflect the height of a ZFT4 tower to the lowest point of the boat's running gear.